When nature in all her glory beckons!! 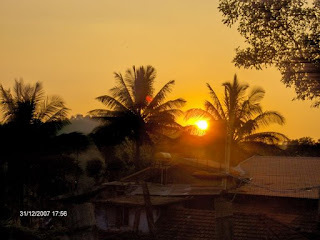 It was during the part of my first Industrial visit in college that I had last been to Coorg, but still I vividly remember that trip partly because it was my first outing with friends to a hill station and mostly because the place bowled us over with its natural beauty. 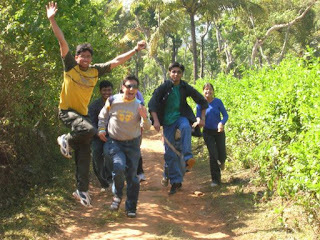 So, I was all excited when Lokesh and the team initiated the plans to celebrate New Year as a team at Coorg. Thanks in large measure to Lokesh, the whole team assiduously planned the journey up to the very last detail. Meetings were set up, menus were discussed, transportation was worked out, a list of necessities was drawn up and phone calls were made to make sure that nothing was amiss and the trip becomes a memorable one for the team and memorable it proved to be in the end!! Manoj, Lokesh, Deepak and Ashish took on the task of driving the team to its destination – Thrill Mountains; a Homestay nestled in nature’s backyard. The journey was not without its share of fun and masti. Finding myself in Deepak’s Indica, I listened to the merits and demerits of every four wheeler that is in the Indian market, learnt how laws are strictly adhered to in the US and found why the vehicle’s pickup was a shade slower due to its diesel engine. We stopped at a roadside vendor’s to quench our thirst with coconut water. It was time for the cameras to come out and from then on, every moment worth capturing and perusal for the future was lapped up with alacrity. For lunch, we stopped at Srirangapatna, a short distance from Mysore. The enthusiastic non-vegetarians in the group drove down to a military hotel a little afar at Deepak’s suggestion and later from their gratified faces, we came to know that the drive had been worthwhile. When we hit the road again, tiredness crept in and at least in the vehicle that I was in, energy levels were a little down. Then, we came upon the forest road to Madikeri and the route with its eerie and nevertheless mesmerizing look brought the energy levels back. It seemed as if, the sunlight was playing hide and seek with us; we’d see the sunlight illuminate our path for a few minutes followed by faint shadows taking over the road. While this alternated, the road got narrower and narrower and Lokesh with his deft maneuvering of the Maruti almost succeeded in making Deepak doubt his driving skills but for Hari’s intervention at encourage ment. It was quite a task for the four vehicles to maintain track of each other what with a KSRTC bullock cart deciding to join the merry race. When we at last sighted the Homestay, we were all rather wondering how reality can take the image-forming mind by surprise for I am sure our minds would have formed fancy images of the place and now as reality dawned it was an occasion for happy confrontation. To our surprise, the mercury hadn’t plummeted as low as we had expected and hence it was a pleasant chillness that greeted us. Two pairs of birds in their cage presented an indescribable sight, for one was left appreciative of their beauty and at the same time had to check an instinctive urge to open their cages and set them free to explore the mystic natural beauty almost waiting to hear their wings flap cheerfully. The place itself presented a challenge to the cars and we were briefly witness to some a dventure sports!! The cottage or Homestay as such beckoned us to unwind and relax; Jambesh found some admirers and Yokesh wore his hospitality robes again. As the night drew near, tables were laid informally bearing the weight of Kingfisher, chicken starters and Foster. The team took seats for Antaakshari and suddenly found itself divided into the young on one side and I shouldn’t say old on the other, but a relatively richer team on the other when one looks at the fact that they had seen aspects of Life that we were yet to confront. The game started and without any doubt the younger brigade was more forthcoming with songs in response to every challenge that was thrown at them. Letters ‘Ha’ and ‘La’ made us rack our brains. Ashley and Hema refused to sing despite our repeated requests but in their own ways enjoyed the fun. As Dec 31 dawned, I found the team sipping tea on the veranda. It was a dawn befitting the place, calm, and encouraging the enthusiastic tourist to explore. After a refreshing bath in hot water that felt like a ritual, we were all ready to face the day. I, Hari and Gopal in our individual ways proclaimed “All the World is mine” upon Hari’s suggestion and they made for some funny snaps. After a hearty breakfast, we drove to the residence of Lokesh’s brother-in-law. The house was going through some renovation and it presented an opportunity for us to look for photographic spots. Amaresh was hyper-energetic and he even tried his hands at tree-climbing to bring down some fruit, I am still unsure what!! 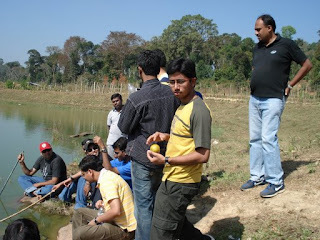 We then went to a small but picturesque lake and there, Rohit set new standards in stone-throwing. Many attempts were made by the team to beat his distance but few if ever even managed to equal his. 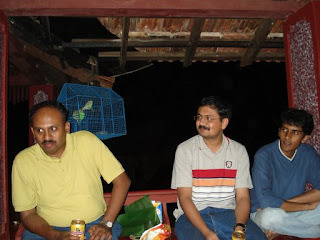 Deepak and Rohit indulged in some mock-fishing and the photos show the results. As we began our trek, we saw coffee seeds that make Coorg stand out from the multitude of tourist spots in this country. In trekking gear, making random lines, exclaiming and prodding, our presence should have made quite an impact had there been any onlookers. Manish Singh became the centre of attention with slogans akin to election chants bearing his name. It was very much like an election campaign for Neta-Manish except that there was no door-to-door canvassing here. Ashish instructed me and Rohit to capture Deepak in a frame of which his would-be bride should be proud of and we were more or less successful in that. 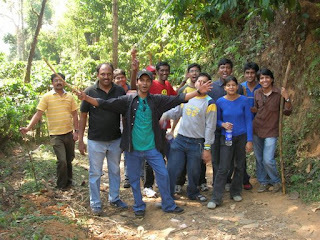 The trek gave us enough room to capture the joy that each of us felt in a wide angle of shots, each to be cherished. We came to a clearing where there was a natural formation of water in a little pool surrounded by rocks of varying sizes. The place was slippery and some of us removed our shoes and carried them while a few sat themselves down unwilling to brave the crossing. I was too engrossed in keeping my footing that for a moment, I almost forgot to admire the beauty. Then, I saw Gopal taking in the scenery seated comfortably and in my hurry to admonish him in a friendly manner for having missed out on the fun of crossing the small pool, I lost my footing and I guess, I have got a mark just a little above my left eyebrow as a remembrance gift for the whole of 2007 in the process. Manoj took a different point of view and asked me to enjoy the fact that the place has left a mark in me literally. I thought that, it was certainly a different point of view. As I reclined on one of the rocks, Amaresh and Rashmi were trying their best to get Gopal and Rohit wet. They had become kids again. Deepak was also given a chase, but he deftly escaped getting wet. Generously, Lokesh’s brother-in-law took me to the Mercara nursing home where my wound was nursed and stitches applied to it. The whole nursing home appeared to have come straight out of a cinema scene and it looked as if we had barged in and polluted whatever was happening there. The place calmed me a lot and after getting the wound treated, we returned to have lunch. It was also the first time, that my hands felt a gun and what could be called bullets that can kill a living thing. Ashish later suggested that I come with him in his vehicle to the Homestay. He said, it would serve both of us good to get some rest for the night and so, we took leave of the team. The drive to the Homestay was easily one of the best parts of the whole trip. Ashish was playing some timeless melodies and the road was winding in a manner that took us back in time so much so that I wouldn’t have been surprised had I seen Amitabh and Dharmendra singing an ode to friendship just then. Ashish promptly had a bath and took a good nap. I wasn’t able to sleep and read for a while. When Ashish woke up, we went down to Yokesh and he gave our menu for the night. There, we met Yokesh’s son, who on talking to said that he walks 5 kilometers everyday to get to his school. So much for our high GDP and National road connectivity!! We then tried our hands at setting up the tent but almost stubbornly the manual led us nowhere and after half an hour we gave up and started our wait for the rest of the team. Time seemed to drag and soon we found ourselves talking. We talked on a wide variety of subjects – cell phones, growing malls, imaginary money, NDA, work and kids. When it seemed as if, the rest of the team would never arrive, we heard the sound of cars. It was a night that could easily be termed a fairytale. I could not believe that I was so happy that I thought I was part of a happy story and am not living all of it at all. 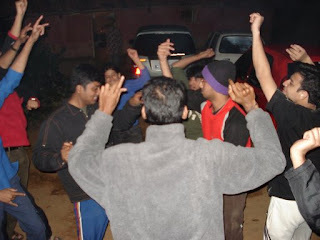 But jolting me from my reverie, campfire was started and Deepak’s Indica served as the stereo system for the night. Food was gulped up and the plates emptied as soon as they got filled. Jab we Me t, for quite a number of reasons seemed to be everyone’s favorite. Shahid and Kareena wouldn’t have dreamt that their exploits in the movie would become such a rage all over the nation and from what I read in the newspapers, music and masti don’t seem to have borders. Slowly, each of us got into dancing mode. Our pace in dancing, if one can term it so, depended on what song was playing and Rohit saw to it that we had the right songs playing. The countdown to 12 o clock started and dancing our way to ‘Deewangi Deewangi’ from OSO, 2008 was upon us. Suddenly, we were all tired and had our dinner of Rotis. Yokesh and his family were invisible. The first day of 2008 was obviously just another occasion in their monotonous life and seemingly, it offered them little by way of a change in their fortunes. But to count one’s blessings, life goes on and sure enough, we saw Yokesh’s son starting his 5 KM long walk in the morning very much indicating that it was just an another day. Hot water became a rare commodity and hence, only some of us gave our bodies a clean rub before starting on our journey back. It was for the most part eventless, save for the bad roads during the initial leg of the journey, partly because we all knew the trip was drawing to a close. Richer by happy memories and giving myself a pat in the back for being part of this enviable team, I got down near Big Bazaar. I am sure that years later, if we turn back the pages of our lives, we’d smile to ourselves thinking about how we celebrated the arrival of 2008!! Shiva..its really fabulous...the use of fresh expressions and avoidance of repetitions are the hallmark of your writing.